FOUR chefs from a prestigious hotel on the outskirts of Aberdeen have sampled a taste of success after reaching the final stages of a top industry competition. 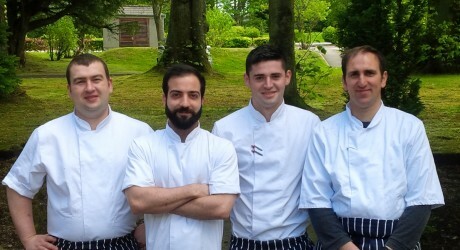 The quartet of cooks from the Mercure Aberdeen Ardoe House Hotel and Spa, are getting set to cook up a storm at the Grampian Chef of the Year competition, which takes place at the North East College in Aberdeen on May 25 and 26. Grant Roberts, 18, demi chef de party, is the youngest to receive a short list accolade. He has been working at Ardoe for two years, benefiting from the tuition of executive chef Richard Yearnshire and his senior team. Senior sous chef Paul Grant, 29, has been eight years at Ardoe and has developed a high degree of expertise preparing gourmet dishes for the hotel’s acclaimed Blairs Restaurant. Glenn Aitken, executive pastry chef, is the oldest of the quartet at 38 and has been at Ardoe for 18 months. The hotel’s shortlisted team is completed by Alex Angelogiannis, chef tournant, who is 27 and has worked at Ardoe for a year. They hope to conjure up a winning recipe in the finals, where they will be judged on professional techniques and skills, artistry and presentation, plus quality and flavour. The finalists announcement is the latest boost for Ardoe, a 19th century mansion house, which is situated in a picturesque setting surrounded by 30 acres of land, just three miles from the city centre. The destination recently underwent an extensive refurbishment programme, including the transformation of the award-winning Blairs restaurant, reception area, drawing room, ballroom, and a number of function and bedroom suites. Ardoe general manager, Peter Sangster, said: “Grant, Paul, Glenn and Alex have shown by their achievement that they are at the forefront of their art in the region. “Their contribution has helped make our prestigious Blairs Restaurant so well appreciated for fine dining. The Grampian Chef of the Year awards will be announced at a gala dinner on May 26.